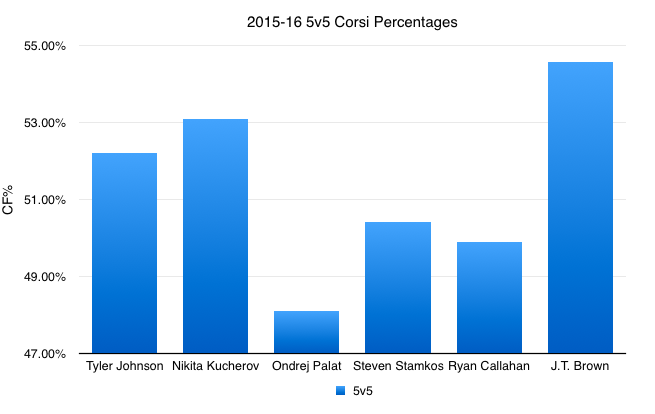 The Tampa Bay Lightning’s start to the 2015-16 season has been underwhelming, to say the least. Not only does the team look nothing like the squad that made it all the way to the Stanley Cup Final last season, but it is also in serious danger of missing the playoffs. Yes, it’s only December, but the NHL’s playoff picture has this funny habit of sorting itself out earlier than the spring. The bottom line is that most Lightning players have failed to live up to expectations set based on previous performance. If that doesn’t paint a picture of Brown’s effectiveness for you, nothing will. The fact of the matter is that he has spent more time generating shot attempts for the Lightning than some of the games brightest offensive stars. More time in the offensive zone means less time in the defensive zone, which means less of a chance for the opposing team to score goals. Dominating possession is basically the name of the game for the best bottom-six forwards in the league, and that’s exactly what Brown has done so far this season: Dominated. 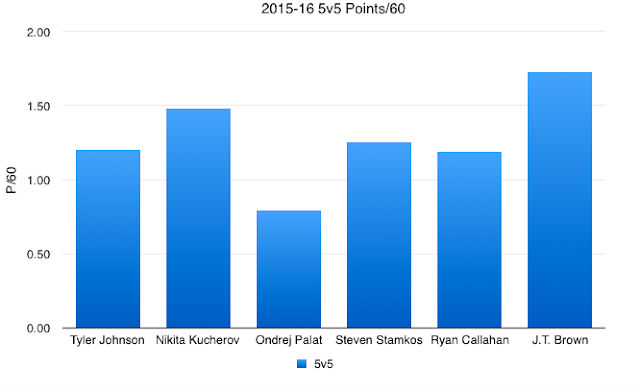 I included Ryan Callahan in that graph not because I view him as one of the game’s “brightest offensive stars,” but rather because I think Brown has been everything to this team in 2015-16 that management hoped Callahan would be when they signed him to that outrageous and untradeable contract. Brown generates offensive zonetime when he’s on the ice. Brown is a pest to play against. Brown makes life hard for the opposition. Are those not the things that Callahan is being paid $5.8M to do? Among the 12 Lightning forwards who have skated in at least 200 minutes of five-on-five action this season, according to War-on-Ice, Brown scores points at the best rate. Better than Callahan. Better than Johnson. Better than Stamkos. That’s a fact. While it’s true that his PDO is rocking along at an unsustainable 104.10 (! ), Brown’s on-ice shooting percentage of 8.47% really isn’t all that far outside the realm of average. There will likely be some regression, but I don’t think fans should expect Brown to fall off the face of the earth. What’s perhaps most interesting about all this is the fact that, among those 12 aforementioned forwards who have played at least 200 5v5 minutes, only Erik Condra plays less at five-on-five every night. Brown currently averages 11.18 minutes of even-strength action despite the fact that he has been so effective to start the season. Considering the fact that the team has struggled on so many nights this season, Cooper shying away from playing one of his more effective players boggles my mind a little bit. But, we’ve seen this story play out before with Jonathan Drouin. Some things in life don’t make a lot of sense. The purpose of this piece isn’t to suggest that Brown is going to wake up and turn into a 50-plus goal guy for the Lightning. It's not to suggest that Cooper should be turning to Brown instead of Stamkos late in games when his team is down by one goal. Rather, it’s to argue that he’s turned himself into a very reliable, dependable, and effective option for a Lightning club that has been lacking some of that on many nights this season, and that maybe it might make sense to throw him an extra minute or two here or there. Basically, J.T. Brown has been an unsung hero whose song needs to be sung.